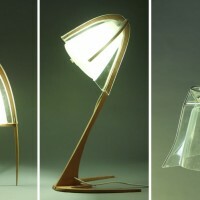 Inon Rettig, a young designer from Israel, has created the Rik collection of stools and lamps that combine wood and plastic in such a way that one confines the other with in it. 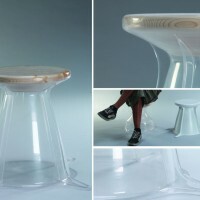 I chose to design and produce a series of stools and light fixtures that combine wood and plastic in such a way that one “confines” the other with in it, giving it form and structure. I worked with the well-known and old fashioned plastic industry technology known as vacuum forming (the processing of plastic bolts through heating and stretching on a tray using vacuum). This is a technology that began with a design orientation but quickly became reduced to a secondary element that is considered inferior within the industry. 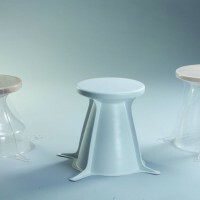 As with every technology, vacuum forming has its unique advantages and disadvantages. One of the primary disadvantages of this technology is the creation of “bridges” or “webbing”: in places where the raw material does not reach the tray’ it sticks to itself to create sort of plastic walls alongside the tray. The idea of this project is to take that same unintentional disadvantage and to turn it into an intentional advantage. Within these limitations, I created an aesthetic that uses the element of chance as a formal language and, moreover, structurally reinforces the object. 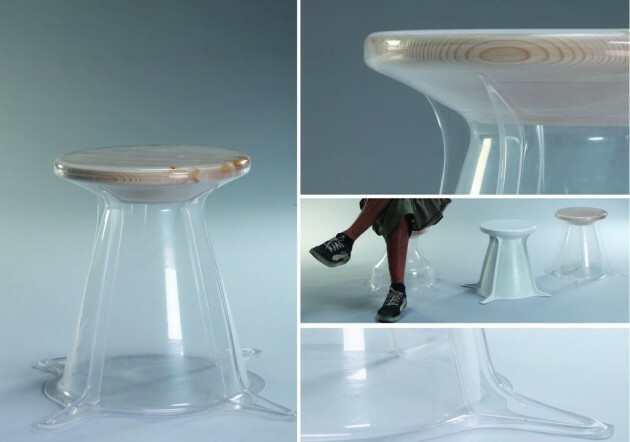 You can watch a YouTube video of Inon vacuum forming a stool – here. Visit Inon Rettig’s website – here.